Yep….I chopped off the border. Lucky for me most of you agreed that the border should go, since I had already chopped it off before I posted the top. :) Its a better wall hanging size without the border, except after seeing these pictures I think I need to iron it out before I really put it on the wall with more than double stick tape. 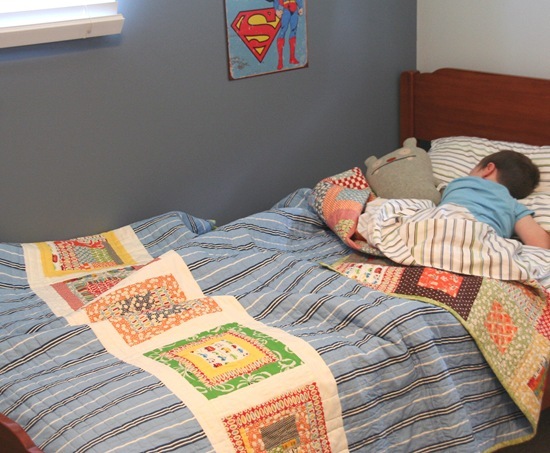 I turned Ben’s quilt over yesterday and I don’t think I ever showed you a picture of the back…so here it is (during nap time…. hallelujah). I love the back almost as much as the front, the stripes are just a sheet I bought from The Company Store. Its nice and soft and 3 year old proof. Is that even possible? 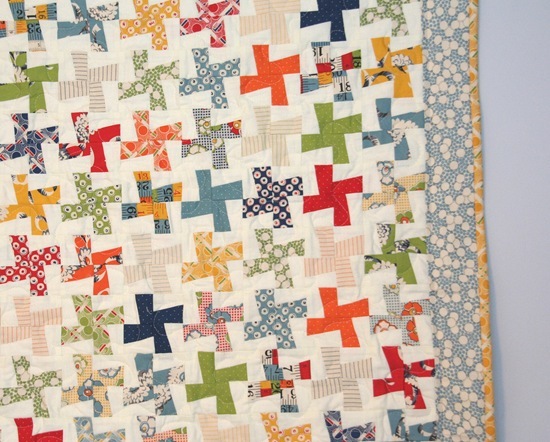 I definitely love the whirly pop quilt without the other border! And the back of Ben's quilt is lovely… love the stripe sheet! I love your decorating style! Show us more! 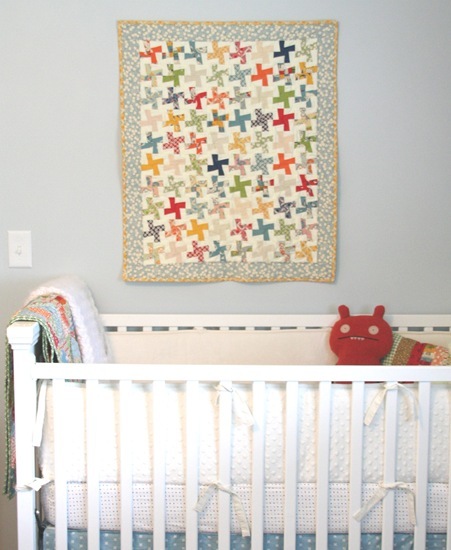 Love the whirly pop quilt! Your son's quilt is awesome on the back. I like the stuffie in his bed too. Oh yes, I like it without the pez border much better. And I'm lovin' that stripe on the back of your sons quilt. Such a great look! Great boys quilts!! Love them!!! The back of the quilt is perfect! I really like the whirly quilt pattern. They are both awesome. I just love the bright fun colors and the stripes too! It's beautiful! Such a fun pattern! It looks much better without the border – I love it! And the back of the other quilt is lovely too, I like pieced backs, I can never be bothered but I think I might start! I LOVE it! How is it that you have so much wee play…I have 2 charm packs and I am guarding them with my life because I can't find it anywhere. Love that bottom photo. Just adorable. The universe makes sleeping babes so damn cute because otherwise we wouldn't be able to quell the desire to kill them in their sleep after a trying day. Okay, that's a bit strong, but I bet all moms know what I mean. Wow, I really like a lot of your stuff…love that wall hanging and love the back of your son's quilt. so so great, love it now with the borders how you have it. You are so talented and your children are lucky to have you as their Mom. Love the bed sheet quilt and the wallhaning looks much better this way. I love the back – it's gorgeous! It looks so streamlined and boyish, especially with the sleeping gentleman under it. That sheet was a find! Seus trabalhos são maravilhosos! Eu amei tudo que vi aqui em seu blog! Que Deus continue te abençoando! Obrigada por compartilhar conosco tantas coisas lindas! Você tem uma fã brasileira, estou te seguindo!